Veuillez entrer votre courriel et votre mot de passe pour afficher les soumissions sauvegardées précédemment. Oui! Je souhaite m'inscrire pour recevoir des courriels ou d'autres types de messages électroniques commerciaux sur les plus récents produits, promotions, offres spéciales d'entretien et plus encore de la part de Subaru Canada Inc. Vous pouvez retirer en tout temps votre consentement en cliquant sur le lien de désabonnement qui figure dans tous nos messages électroniques commerciaux ou encore en mettant à jour vos préférences avec nous. Fun, stylish and value-packed: Subaru sedans deliver the goods! The Subaru line-up of 4-door sedans is as affordable, durable, fuel-efficient and fun a collection of cars as you’ll find. From the incredibly dynamic, midsize Subaru Legacy to the latest-generation Subaru Impreza, and from the exhilarating Subaru WRX to the outrageous WRX STI, these Japanese sedans all offer the legendary performance of the SUBARU BOXER engine and Subaru symmetrical All-Wheel Drive. All of these vehicles deliver a high level of entertainment behind the wheel, exceptional safety ratings and tremendous value. 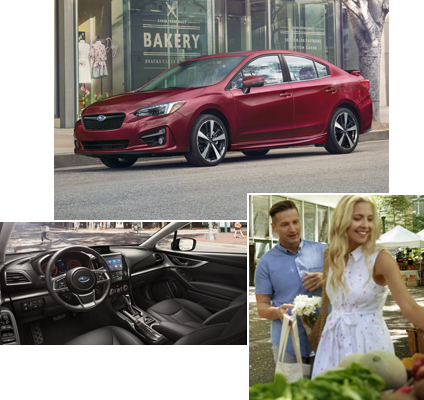 Armed with the legendary Subaru Symmetrical Full-Time AWD system, a refined SUBARU BOXER® engine and the Subaru Global Platform, the 2019 Subaru Impreza is stronger, safer, more stable and more fun-to-drive than ever before. One of the most fuel-efficient AWD compact cars sold in Canada, the Impreza also features bold styling, great infotainment systems, undeniable comfort and incredible convenience. 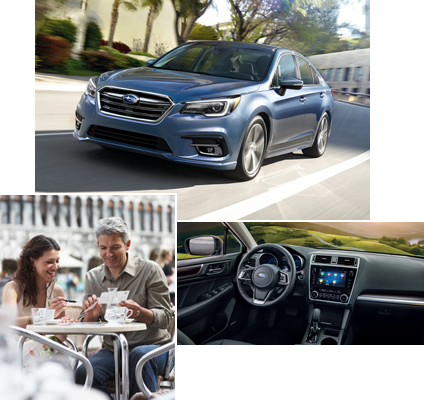 The Impreza is a 2019 IIHS Top Safety Pick+** (on models with EyeSight® and specific headlights). Desirable tech — Available 6.5 or 8-inch touchscreen, standard Bluetooth® connectivity, Apple CarPlay®, Android Auto and available SiriusXM satellite radio installed (3-month free trial included). Exceptional safety — available EyeSight® Driver Assist Technology with High Beam Assist (HBA) and Reverse Automatic Braking (RAB). Superb driving dynamics – Sharp handling backed by all-road/all-weather Subaru Symmetrical Full-Time AWD. The 2019 Subaru Legacy is a midsize family sedan that sets new standards. While it delivers what's expected from a Subaru - quality, safety, reliability and dynamic handling - it also offers no small amount of style, spaciousness and comfort. The Legacy is a 2019 IIHS Top Safety Pick+** (on models with EyeSight® and specific headlights). Luxurious cabin - The long list of available creature comforts includes a new infotainment touchscreen infotainment system with rear-view camera and available SiriusXM™ Satellite Radio installed (3-month free trial included). 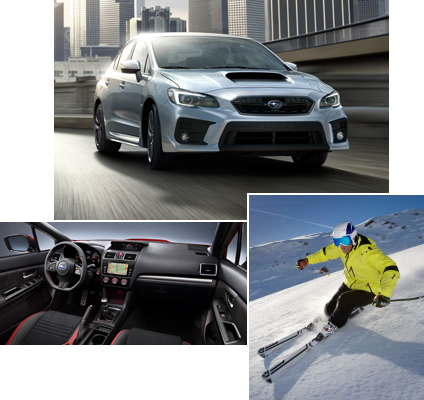 Powered by a turbocharged SUBARU BOXER engine and featuring the world-famous Subaru Symmetrical Full-Time All-Wheel Drive system, the 2019 Subaru WRX 4-door provides an exhilarating driving experience from start to finish. The WRX is a 2019 IIHS Top Safety Pick+** (on models with EyeSight® and specific headlights). Aerodynamic design – The aggressive, wide look includes a functional hood scoop, cooling vents, ground effects and rear spoiler! Turbocharged response – The turbocharged 2.0L direct-injection SUBARU BOXER engine generates plenty of horsepower, torque and grins! Driver-oriented environment – The 6-speed manual or Sport Lineartronic® transmission, performance-designed sport seats and sport pedals create maximum driver involvement! Superior features – A power sunroof, heated front seats and enhanced infotainment are just a few of the available creature comforts on board! 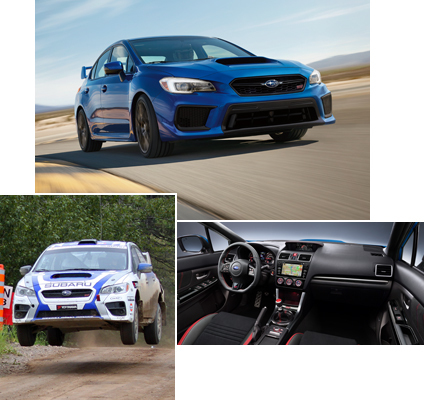 The 2019 Subaru WRX STI represents the purest expression of the Subaru philosophy in virtually every measure of performance. Armed with one of the most advanced AWD systems in the world, this compact, 4-door sport sedan takes desire to a whole new level. Raw performance – The high-output, 310-horsepower turbocharged SUBARU BOXER engine is built to thrill! Driver-focused technologies – Advanced multi-mode DCCD, multi-mode VDC and SI-DRIVE for ultimate involvement! Wicked good looks – Aerodynamic bodywork features a hood scoop, cooling vents, ground effects and massive rear spoiler (on select models)! Surprising comfort – The cabin features Ultrasuede with red leather inserts, automatic climate control and an advanced infotainment system. Not sure what Subaru is right for you? Use our Vehicle Selector tool to compare them all. **To determine crashworthiness, IIHS rates vehicles good, acceptable, marginal or poor, based on performance in five tests. To qualify for 2019 Top Safety Pick+, a vehicle must earn good ratings in the small overlap front (driver-side and passenger-side), moderate overlap front, side, roof strength and head restraints tests. Vehicles must offer, as optional equipment, an autonomous emergency braking system (Subaru EyeSight®) and earn an advanced or superior rating for front crash prevention. Vehicle must also offer specific headlights that earn a good headlight rating. For more details, visit www.iihs.org. 1ALG is the industry benchmark for residual values and depreciation data, www.alg.com.